Starting from the "GyroStation" accessible in Facility 1 and Facility 2, you find yourself in Facility 3. The hallway out of the "GyroStation" leads you into a large open room where the "GyroSphere" is located. In the elevator you are given a choice of 7 floors to explore, which are explained below. As with every facility, as you complete each game or unlock each room, another ring of the "GyroSphere" will start spinning. 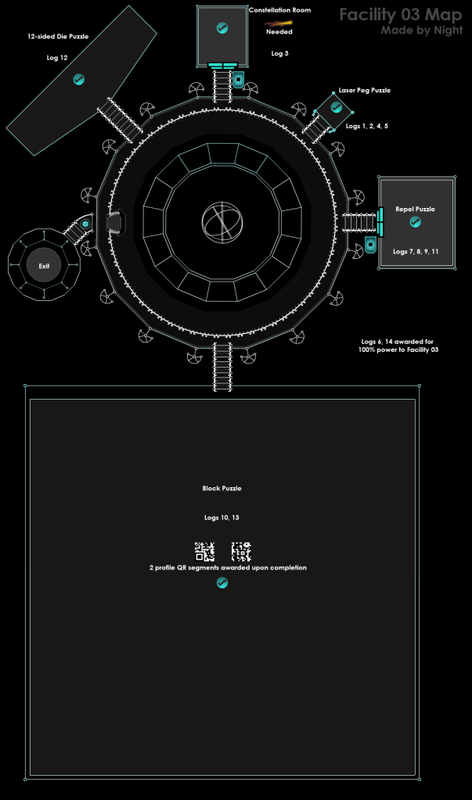 Once all of the rings are spinning, you have fully powered Facility 3 and should earn your achievement. This is the floor you would be on if you chose to "jump" from the main level. There is nothing to explore on this floor. You will need a Facility Key to access this room. This is where the "Repel Puzzle" is located. Match the colored blocks in groups of 4 or more to make them disappear by aligning the cannon with you arrows and then clicking with your mouse. 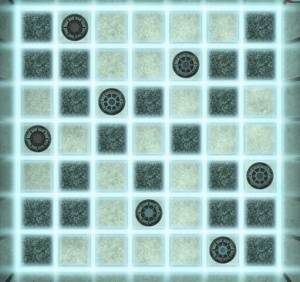 Some levels require you to move around the board, you can do this by simply moving to the edge of the row you are on and then hitting the next direction. When you do this, the colored blocks already on the board will move away from the row your cannon is now on. For most of the levels you will need to do this to arrange your tiles in a way that you can make them match. 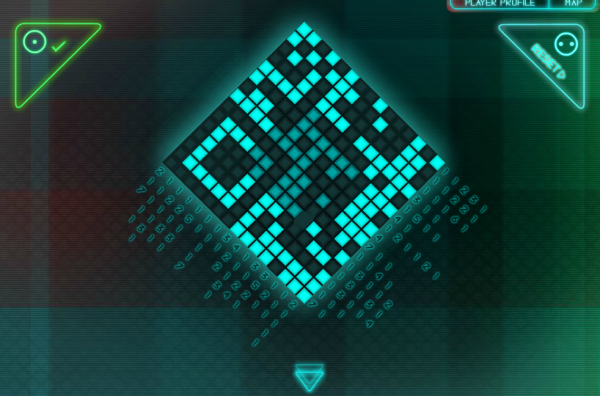 Just like the "Music Bounce" and "Lava Puzzle" in the previous facilities, you will receive more achievements with the more levels that you complete. There is a "reset" button if you find yourself stuck and wish to restart the level you are currently on. There are currently no "cheats" for this puzzle. This floor has the "Lazer Peg" puzzle. Like in Facility 2, the goal is to align all of the pegs on the white squares so that they are not horizontal, vertical or diagonal from one another. This is the Constellation room. As with the other Facilities, you will need a constellation key to make the pattern on the wall light up. This needs the "Flare" Constellation key. This is the "12-sided Die" puzzle. The pattern in front of you is an unfolded 12-sided dice and you must use the two rotating die on each side of it to figure out where the pieces below are located. Click on the pieces/symbols in the box below and then click on the pentagon spot where you wish to place it. Click on it again to bring up an arrow to rotate the symbol into the correct position. If you wish to remove a piece, simply click on the symbol and then click the box below to put it back. 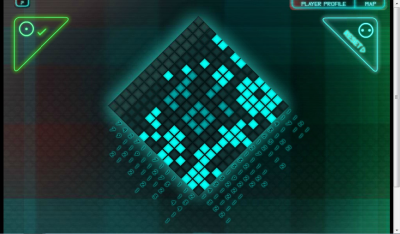 The "Block Puzzle" are two separate puzzles where you must apply the pattern listed at the end of each row and column that match the number of lights that are out or on. The numbers tell you how many of either out or on lights are grouped together. 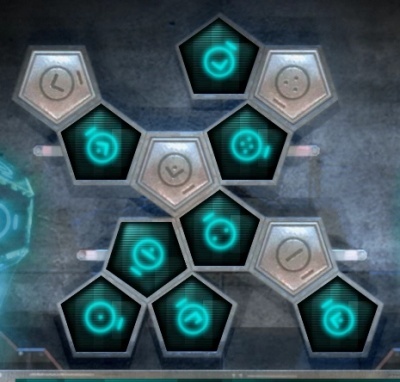 So, for example, the first row of the first puzzle is "1121" which means that there are 3 single groups of lights and one group of 2 lights that are "out". The groups cannot touch each other so remember that there must be at least one "on" box between each group. This is the main level that you started out on.